Tagged: UHaul building on 230th St. This topic contains 3 replies, has 3 voices, and was last updated by Dorothy Dewitz 1 week, 1 day ago. Any information on what business originally occupied this building on 230th St. between Corlear and Kingsbridge Avenue? 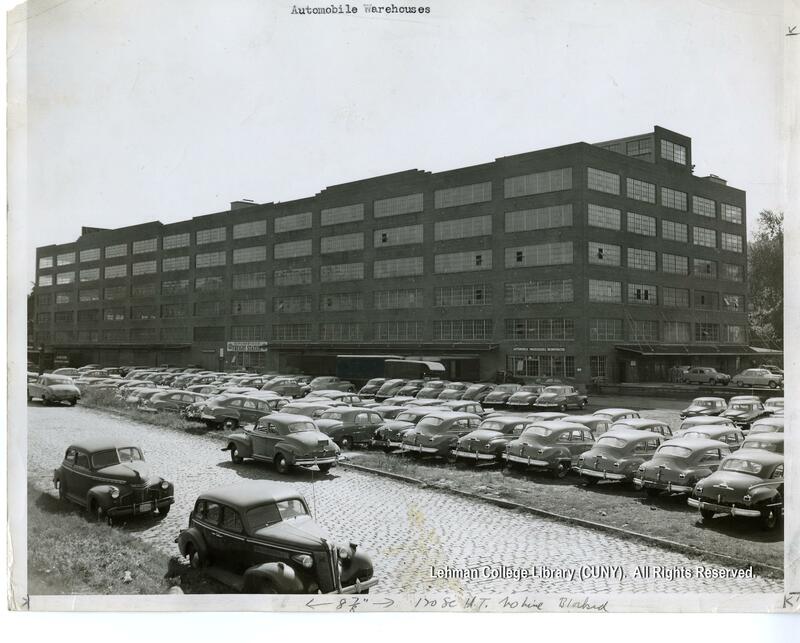 In 1946 it was an automobile warehouse, as shown in this pic. Before that, I’ve seen folks refer to it as being owned by the New York Central Railroad, likely the original owner. It was adjacent to the rail yards, and convenient to them. NYC GIS says the building was built in 1923. In this 1951 aerial photo, you can see that there were ramps from Terrace View Avenue that led to the upper floors. The rail yards, that later became the site for JFK, are also visible. 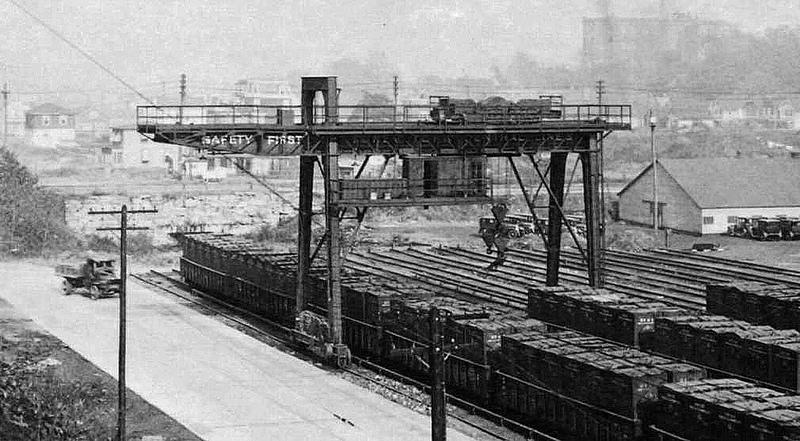 Kingsbridge Yard was commonly known as FH Yard, for FH Tower that controlled the yard lead at the east end of Spuyten Duyvil Rock Cut. I believe that FH came from a name for Fox Hollow, but I can’t document that. The freight station was known officially in tariffs as Kingsbridge, but it was in the time-table as FH freight station. FH yard was actually on the original alignment of the NYC main tracks from when they passed north of Kingsbridge. After the Harlem River Ship Canal was cut through, the RR was realigned along the canal to avoid some perilous curves. That also accounts for the little piece of New York County and the Borough of Manhattan on the mainland adjacent to The Bronx. The river was moved south, but the borough boundary remained where it was. I don’t know when FH Yard closed down, but it was running full blast when I worked there in 1960-61. There were several traveling switchers based there, which later moved to Yonkers. The primary business was an automobile warehouse run by Kenosha Auto Transport for distribution of American Motors Ramblers, etc. ; a freight house, and a team track. There are some others around who were there when FH shut down, and they probably have a better handle on the date. I think it happened in the middle of the 1960’s, just before Penn Central. There was a new yard office at Yonkers in 1963 or 1965, and I think that was on account of moving the crew headquarters up there. In 1960, the Ramblers were moving from Kenosha, WI to FH in double-door box cars known as “auto racks” from the internal arrangement of hoists and ramps in the cars. In 1961, they were moving in bi-level cars, also called “auto racks.” The Hudson Division didn’t have sufficient clearances to run tri-levels. Bronx Terminal Market was served by the NYC up to Penn Central days, when most of the perishable traffic went to Hunt’s Point (after PC got the New Haven) or just to trucks. BTM was owned by the City of New York, and everyone there rented their space from the City, even the NYC for the yard office. It was right next to another space leased by Hans Holterbusch, the Lowenbrau distributer for the area. I always avoided the opportunity to violate Rule G when I worked at BTM, even though I was 18 years old, and that was drinking age in New York State. I enjoyed my RR job too much, and in that part of the world I really needed to keep my wits about me all the time. I had an excellent relationship with the NYPD from the 44th Precinct, on the hill near High Bridge. They often stopped by for a cup of coffee around quitting time, and they were usually good for a ride over to catch a train at High Bridge. Thanks to both posters for the interesting information.